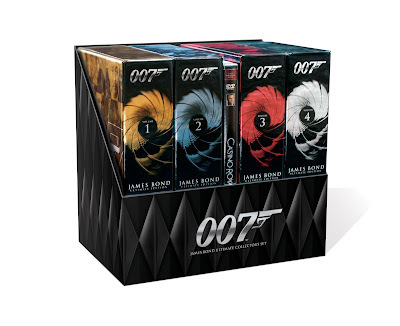 Home » » Forthcoming Bond Box sets: U.K. gets a neat one, U.S. gets the shaft. SKYFALL: Latest Video blog with Dame Dench and production designer Dennis Gassner. Forthcoming Bond Box sets: U.K. gets a neat one, U.S. gets the shaft. MGM is releasing a box set of ALL of the James Bond films (ok, not ALL since the original Casino Royale will not be included) in both region 1 (North America) and region 2 (U.K.). Neither of these has any new features, but simply include the Casino Royale remake along with the previously remastered films. But all is not fair, let us take a look at the two. First the U.K. package: 21 films plus two sets of branded Casino Royale playing cards and a complete set of poker chips from Carta Mundi, as seen in the film. £199.99 RRP with a November 12th release date. Very cool packaging to snag anyone that has not already picked up the remastered versions (and some that have). 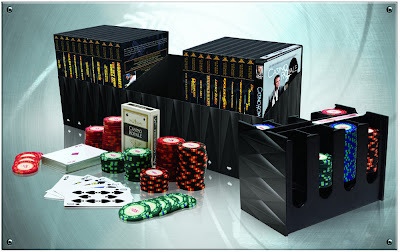 Volumes 1-4 of the The James Bond Ultimate Editions along with the 2 disc version of Casino Royale…and that is it. No chips, no cards, not a damn thing! $199.99 SRP with a November 6th release date. I already own these films, but clearly the U.K. is getting a little more love for the holidays.